Home » Look Young by Latest Hair Transplant in Manchester!! Look Young by Latest Hair Transplant in Manchester!! Manchester had reported 11,000 cases of premature balding and hair loss in the year 2013. Many people were losing hair because of the environmental and climatic conditions that were adverse for healthy hair. People were becoming sad and losing confidence in their work. Thus there was a need for a solution to the hair problem faced by the people in Manchester. 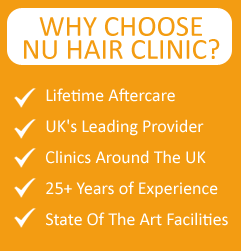 We at Nu Hair Clinic decided to open up a center in Manchester that can cater to the needs of the Hair Transplant for men women Manchester. Since our inception in Manchester we have found the influx of clients and have tried to solve their problems to the best of our abilities. In most cases we have been successful and our clients have shown positive responses. It is in our hearts to make sure that our clients become happy after they have come to us for help.We have a variety of solutions that can be provided to address the myriad hair problems faced by people in their lives. Recently in addition to the methods of Mesotherapy, FUE, eyebrow restoration etc.we have started a new method called Platelet Rich Plasma Therapy that has shown good results in the Hair Transplant. Let us discuss about it in detail. Platelet Rich plasma Therapy (PRPT) is a scientific method that has been developed to cure all your hair problems. We at Nu Hair Clinic have adapted PRPT to provide superior treatments to your hair problems. It is a non-surgical therapeutic option which helps in stimulation of hair for both men and women. The human blood contains essential growth factors and stem cells that instigate the growth of tissues. In order to undergo PRPT you will have to provide us with your blood just like you would at the time of a blood test. This blood will be treated and the Platelet rich plasma will be separated from your blood. This PRP is then inserted into a tube which also contains other vital growth proteins. A micro needling stimulation is performed on your scalp under a local anesthesia. The micro needling stimulation helps in inducing healing and repair of your scalp and hence the cells start replenishing. The perforation that is created enables the cells to breathe and thus helps them to rejuvenate. In general PRPT is performed by clients at an interval of 3 to 4 months. Some clients undergo PRTP semiannually or annually too. We have some of the best doctors in the world who are specialized in PRPT. They are posted at our clinics and try to devise the best treatments which are custom made for each client. Who should not have PRPT? Not everyone is recommended a PRPT. If you have been a heavy smoker or a user of alcohol and drugs cannot undergo PRPT. Also if you have liver disease, skin disease, cancer, metabolic or systemic disorders, acute or chronic infections etc. it is advisable that you avoid PRPT. So if you desire to undergo a PRPT you must first undergo a medical checkup. Hair Transplant for men women Manchester has been very successful. So stop worrying and book an appointment today. We will solve your problems happily.